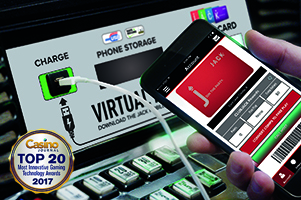 Detroit-based gaming-hospitality company JACK Entertainment is excited to announce that its revolutionary player technology product, Virtual Players Card by GT Connect, has been honored by Casino Journal as one of the Top 20 Most Innovative Gaming Technology Products of 2017. In its 20th year, the competition recognizes the most innovative technology offerings in the gaming industry. JACK Entertainment developed Virtual Players Card by GT Connect along with its innovative mobile app to simplify and enhance the guest experience. The patent-pending GT Connect technology connects a Virtual Players Card via a secure USB port installed in all slot machines. While connected, guests are able to earn rewards, download free play and securely charge their smartphones, using any USB cord. The mobile app features exclusive app-only promotions, comps and free play bonuses. The app also allows guests to request their vehicles from valet, redeem comps at restaurants, access offers on the go, and more. Virtual Players Card by GT Connect launched in January 2017 at JACK Entertainment’s portfolio property Greektown Casino-Hotel in Detroit and was recently installed in the high-limit gaming areas at JACK Cleveland Casino and JACK Cincinnati Casino. This is the second award that JACK Entertainment has received for Virtual Players Card by GT Connect. In October 2017, the company was the first operator to ever receive the gold medal for Best Consumer-Service Technology from the Annual GGB Gaming & Technology Awards. Gaming-industry companies interested in purchasing Virtual Players Card by GT connect may contact GTConnect@jackentertainment.com for more information.